There are quite a few companies with Artificial Intelligence (AI) projects on the go — some look promising, others gimmicky. I am going to check out some of these projects and analyse what’s been happening behind the scenes. Project Muze is an experimental collaboration between European eCommerce site Zalando and Google. It was one of the first “machine learning” projects to dabble in fashion design, and it shows. Muze doesn’t assemble products, it only provides variations of 10 different base models. Colours and prints are the only things that vary. These are generated based on several “inspirations” given by users, such as gender, age, mood, style, music, animal spirit, colour, and a hand drawing. These inputs are then fed into an algorithm trained with similar “inspiration” data. It then generates an output that is… well… random. Case-in-point, say you selected the colour “blue” as one of your inputs — the output will likely lack a single streak of blue — it uses the blueinput to “inspire” the design rather than feed into the design. Project Muze is little more than a marketing exercise for Zalando. It’s certainly not a serious attempt at an AI design tool despite packing as many buzzwords into the website as possible. Simply install our app on your phone which translates a week of your life into a one-of-a-kind design… Let the app learn who you are, what you like to do, and where you like to go. 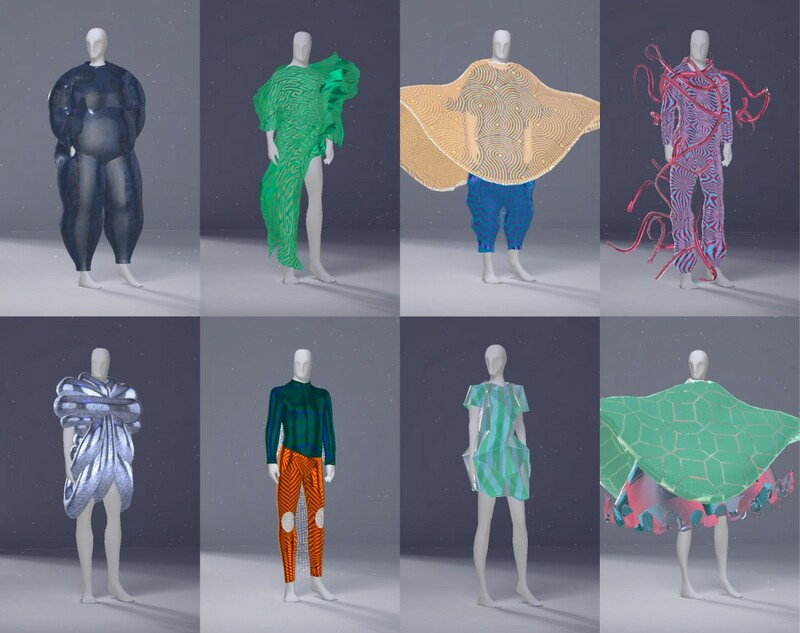 Demo screens from Ivyrevel’s coded couture app. You can see how they plan to extract the data from users. Alternatively, the app already knows the user’s workplace and now wants to classify their character (n.b. “Did you rock at work today?” and “Dio’s two-finger gesture” illustration). I’m not convinced — Ivyrevel is a brand with a distinct target market. It could be the brand reinforcing its voice while extracting the info it needs from the user. There are more clues in the promotional launch video. The app can be seen prompting the user to check into the place they’re visiting. Using Google Maps API there’d be a bunch of meta-data associated with each location, allowing the app to build a profile around their character based on the places they visit. The last piece of the puzzle is the purpose for the dress; business, party, or gala. This dictates the best base block to use, and the other lifestyle indicators feed into embellishing the block. Design variations are limited to a matrix of fixed possibilities. Given these designs are to be manufactured, the pool of possibilities must be quite limited. Ivyrevel is banking on lifestyle data informing design rather than more tangible inputs like social media and point-of-sale data. Is this enough to create relevant designs? At first glance Ivyrevel’s Coded Couture doesn’t seem to use the full potential of AI-driven design, however it looks like a step up from Project Muze. The jury is still out regarding how much design variability it can generate, and how relevant the designs will be for each user. Stitch Fix is one of the most exciting startups I’ve come across in the AI space. Rather than have an eCommerce site to sell products, they’re a subscription service that asks a bunch of questions to build a style profiles for each user. This feeds into a recommendation engine that selects products that fit their profile. These products are then picked, packed and sent to them. They try the pieces on, keep what they like, and return what they don’t. The innovation is in the recommendation engine — each time a user sends products back, the algorithm learns what they like, don’t like, what fits, and what’s in their price range. This is incredibly valuable data which puts Stitch Fix in a powerful position in the age of AI design. In fact, they’ve started developing their own products using this data, which currently accounts for around 1% of all sales. Unlike Ivyrevel’s Coded Couture, Stitch Fix creates products around user feedback, which is so rich that machine learning algorithms can synthesise different trends into new products that have a high likelihood of retail success. For example, an algorithm might observe three independent product trends and combine them into a new product. This algorithm can calculate exactly which segment of their customers would likely purchase it, and provide accurate estimations of quantities the company should produce. If the algorithm identifies a trend and designs a product, there’s still a lot of coordination and lead-time involved in bringing that product to market (say 4–8 weeks). By the time the product has been distributed to customers, it may have fallen out of trend. There’s a limitation in the creative potential of AI-designers reliant on this mass-production model — designs must have markets big enough to justify producing it at scale, which in turn limits how relevant products can get for individual consumers. Stitch Fix is sitting on a mountain of data which is perfectly suited for AI-driven design. There’s always a risk however of missing the boat due to lead times in bringing products to market, and limitations to the creative potential of AI-designers working within the constraints of a mass-production business model. A product assembly backend with billions of possible combinations — not prescribed variations like Project Muze and Ivyrevel. Photorealistic rendering of assembled products — AI-designers should assemble, render, and launch products instantaneously, without human intervention. On-demand production — products should be designed and produced on a person-by-person basis, not for the smallest commercially-viable group of people. Assemble products based on billions of possible design combinations through its pattern library. Photo-realistically render assembled products so they’re indistinguishable from physical samples. Generate and feed custom-fitting patterns and product details instantly to on-demand manufacturers for production. AI design is not far from booting human designers off their lofty pedestals. Data is increasingly leading the fashion industry forward, and innovative companies have made great inroads leveraging data to drive the design process. There’s still some way to go, and equipping AI-designers with a self-sufficient ecosystem to design, render and produce product on-demand will become a key focus moving forward. I’m really excited to see how this develops and to very soon see AI disrupting the fashion industry and ruling the runway. Marc C. Close is the co-founder and CEO of Bespokify. Based in SE Asia, the Bespokify technology allows patterns to be made on-demand for brands, which helps reduce overhead and inventory challenges.